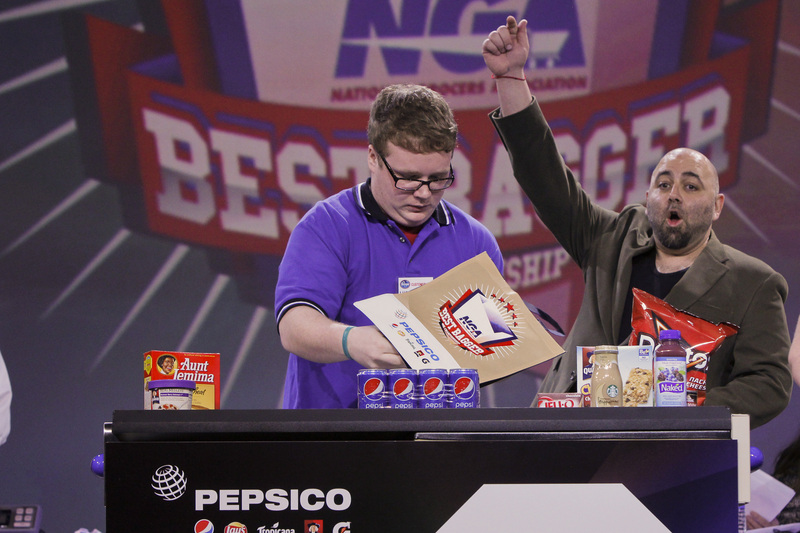 Arlington, VA –Food Network star, Duff Goldman will once again emcee the National Grocers Association (NGA) Best Bagger Championship, sponsored by PepsiCo, and held at The NGA Show in Las Vegas, Nevada from February 28 – March 1, 2016. “We are excited to be sponsoring NGA’s Best Bagger competition for the fourth year. The Best Bagger event is a great way to support and recognize the importance of independent grocery retailers and wholesalers which are the backbone of their local communities,” said Art Rosenberg, VP of Industry Development, PepsiCo. The NGA Best Bagger Championship will be held Monday, February 29, from 5:00 p.m. – 6:15 p.m. (PST) in the Grand Ballroom at the Mirage Hotel and Casino. The NGA Best Bagger Championship is the culmination of contests held across North America, in which one contestant who has won their statewide competition is eligible to compete in the championship and vie for “bagging rights.” Nearly 30 baggers will compete for the 2016 Best Bagger Champion title and the grand prize of $10,000. Contestants will be judged by speed of bagging, proper bag-building technique, weight distribution in the bag, as well as style, attitude and appearance. Duff Goldman graduated from the University of Maryland, Baltimore County, with degrees in history and philosophy, and went on to study at the Culinary Institute of America at Greystone in St. Helena, Calif. He worked at several acclaimed culinary destinations, including the French Laundry, the Vail Cascade Hotel and Todd English’s Olives before returning to Baltimore in 2000 to become a personal chef. In March 2002, Duff quit his day job and opened Charm City Cakes. There, he was able to show off his creativity, which comes from a long line of artistic genes. The bakery became a household name on the hit Food Network show Ace of Cakes, which aired for 10 seasons. More recently, Duff and his team opened a second bakery location, Charm City Cakes West in Los Angeles. Registration for The NGA Show is available at www.theNGAshow.com. For more information on the NGA Best Bagger Championship, visit www.bestbagger.com.